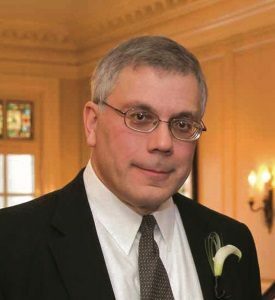 Steven Zwillinger – an active philatelic researcher, author, and exhibitor – is the new president of the American Philatelic Research Library Board of Trustees. Zwillinger, elected as a trustee through 2022 in last year’s APS elections, was chosen unanimously August 4 by a voice vote of the APRL board during an organizational meeting held during StampShow in Richmond, Virginia. He replaces Roger Brody, who ended eight years as president this month. Zwillinger will serve a four-year term as head of the eight-member board. Prior to last year’s elections, Zwillinger had served on boards of both the APRL and the American Philatelic Society. Zwillinger, of Silver Spring, Maryland, has won gold medals for his exhibits of India and Burma, and has had articles published in the Philatelic Literature Review, the Philatelic Exhibitor, as well as a regular column about exhibiting in The American Stamp Dealer & Collector. The ASD&C column culminated in last year’s publication of a how-to book for exhibitors, The Path to Gold: 175 Proven Stamp Exhibiting Tips. Zwillinger notes in his first column in the forthcoming issue of the Philatelic Literature Review that a lot was accomplished under Brody’s leadership – from the completion of the new state-of-the-art library space at the American Philatelic Center to the acquisition of resource materials of all sorts. Zwillinger’s early goals, according to the column, include reviewing the library’s acquisition and collection policies, promoting library holdings, and furthering technology initiatives. – That the board draft a policy for special collections. – That all APRL board members submit a short article for inclusion in a future issue of the Philatelic Literature Review. –That each APRL board member be a financial contributor to the library. –That board members share their passion for philatelic literature. Also at the organizational meeting, Patricia Stillwell Walker, who has been serving as vice president, was re-elected as vice president. Zwillinger appointed Ken Nilsestuen to chair a committee to create a policy for special collections. Brody, Walker, and Don Heller were appointed as interim trustees who will serve on the APRL board until the 2019 election of new trustees, and were sworn in by APS/APRL attorney Kathleen Yurchak.